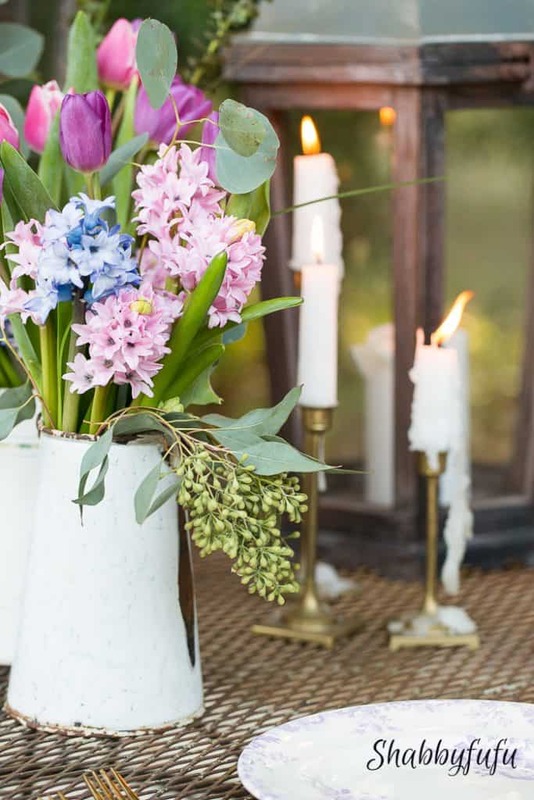 The flower budget is always a consideration for many of us, and how to make that budget stretch. 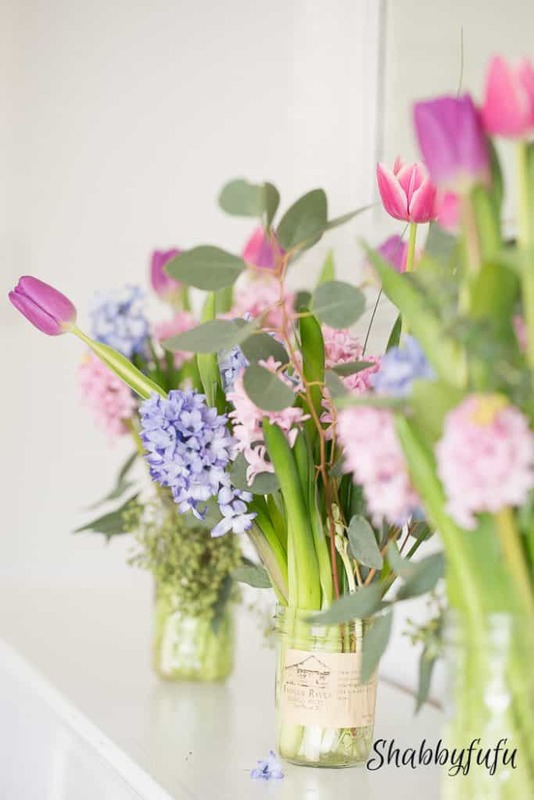 Are you tempted every single time you head in to do your grocery shopping to load up on flowers? You know how they purposely try and woo you over to the dark side with the candy prominently put at the level of your eyes at the check out? I used to work in retail marketing and of course that “checkout lane enticement” is a trick as old as the hills, but not what I’m focusing on today. I’m talking about the beautiful blooms that seduce you with color and at this time of the year lots of fragrance. 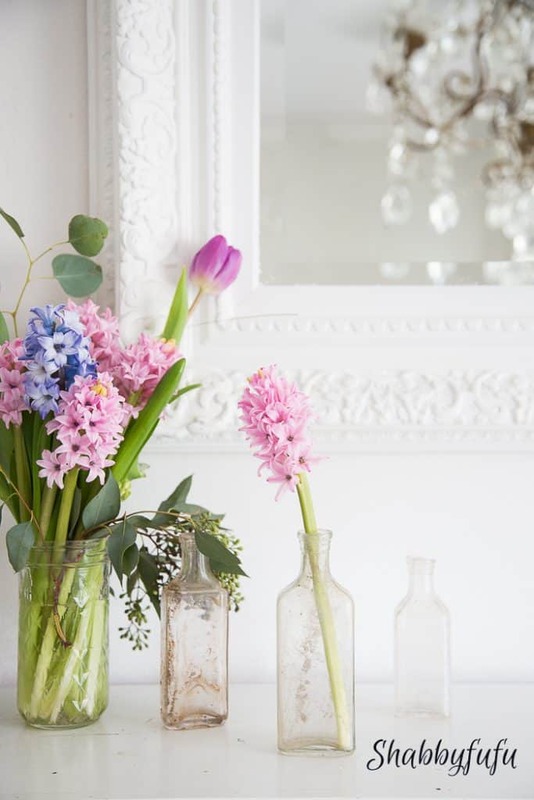 You can really be thrifty though with just a few tricks of display, and here are 5 of my favorite flower budget stretching tips. I shot this outdoors last night and will have more of this to show you later in a special post with friends. Candles are one of my favorite ways to entice that relaxation mode and sometimes I’ll have just a single bloom in a jar and load up the table with inexpensive dinner tapers as the ones above. I’ll have to add that where you shop for flowers does make a difference and I buy seasonal flowers whenever I can find them. 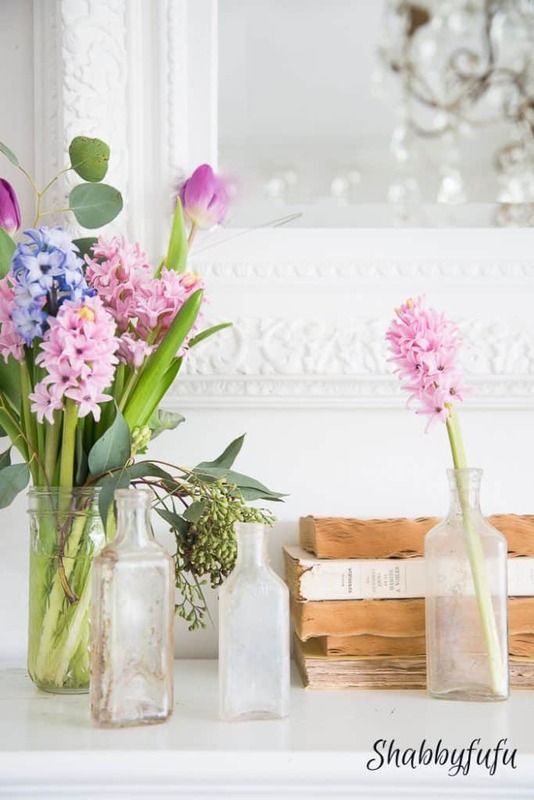 I loaded up yesterday at Trader Joes (flower budget friendliest place that I’ve found) with some special upcoming photo shoot work, but found tulips, hyacinth, and seeded eucalyptus and the prices were reasonable as can be! 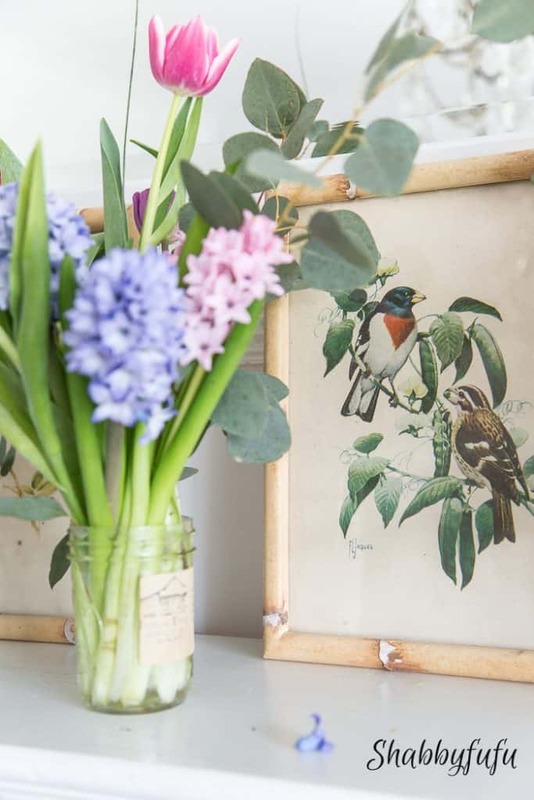 Spring is being born here already, and I’m sprinkling in seasonal artwork around my home. 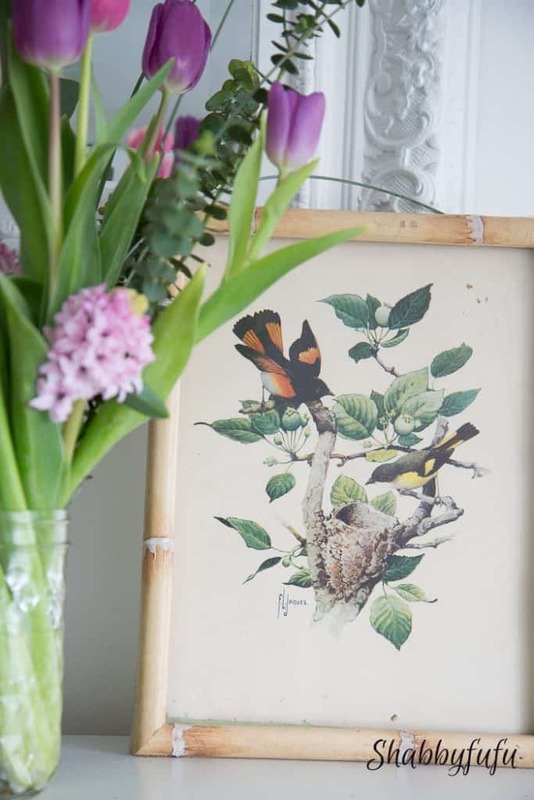 I’ve been collecting bird prints for years and pulled out this set of 1920’s lithographs in authentic bamboo frames. I recall picking those up at a yard sale. They are tattered to perfection and are small enough to simply prop in my mantel vignette. Pick up some inexpensive artwork when you find something that speaks to you! Display alongside your florals and you won’t need a mass quantity of flowers. You’ll still have lots of color and interest. I have a GUIDE in THIS POST as I’ve taught PHOTO STYLING for the last couple of years at the HAVEN CONFERENCE. It’s free for you to download. When I tire of the bird prints being on the mantel I store them in a prop cabinet. The beauty of not hanging your art, but simply propping in a vignette. 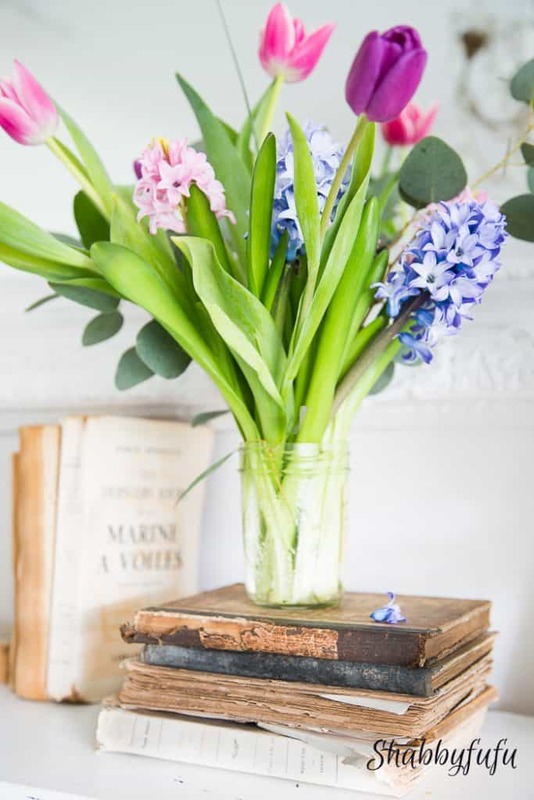 Old books add a personal touch and add height to this simple flower arrangement in a jar. For the price of a bunch of grocery store flowers it is effortless and non forced beauty. These books are old and I do love to mix my pages turned out for some texture. Uncomplicated and light as air and if you’d like to learn my tricks for making NEW BOOKS LOOK OLD I have a slightly different way than most. The piece above is just one of those things. We had a reproduction poster bed at one time and I was tired of it (insert – husband eye roll). I decided to saw off the posts after removing the finials. 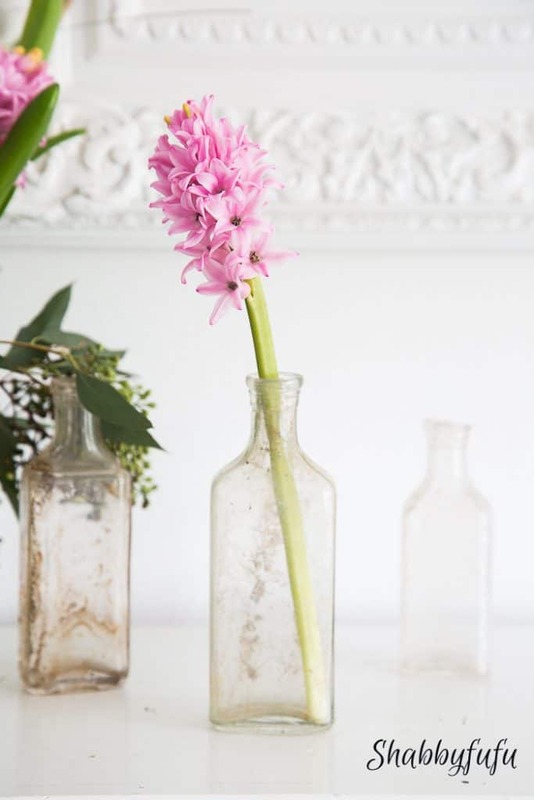 Look for things like old finials, corbels, doorknobs, chandelier crystals and be open to repurposing. 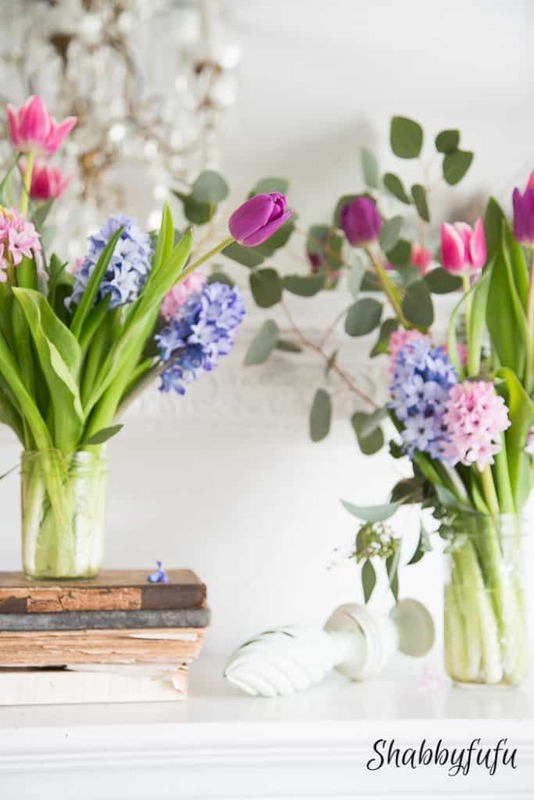 One or two jars of flowers and an element or two is easy as can be. I’m not a hoarder, but I love all things bottles and jars! You’ll often find old ones at thrift shops for pennies. 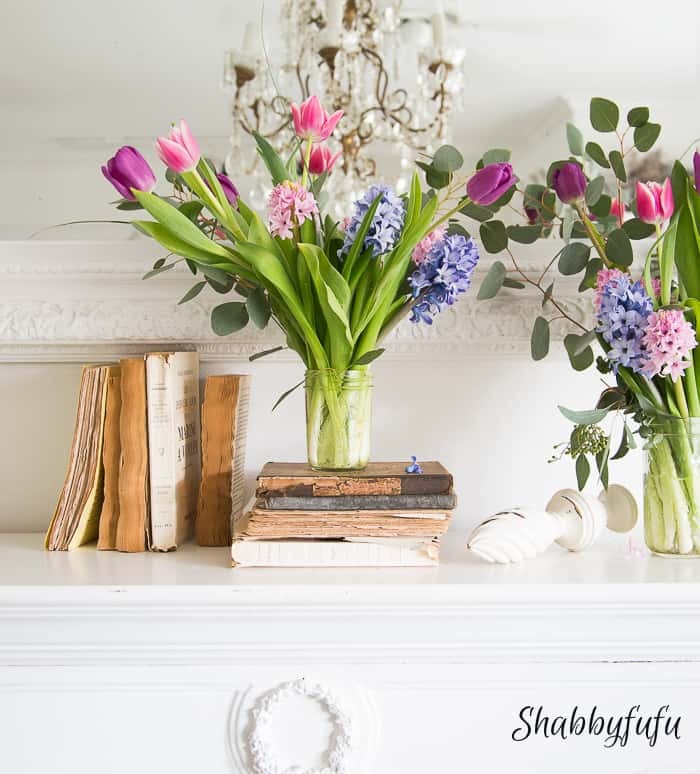 Not only are they perfect for a single bloom, but when you are creating vignettes think of grouping. Three are better than one and five are better than three sometimes. I like to group in uneven numbers and that’s just what my eyes tell me looks good. Lastly, play around and edit. Do you prefer the books in the vignette or a clean look as above? It’s all a matter of taste and what looks good to you. There are no rules, at least I don’t follow them if there are! I do a weekly flower run at Trader Joe’s…the best way for me to spend less than $20 for the most part to bring “happy” in to the house! Just loaded up on tulips and hyacinths too and I so love this time of year for those flowers! I planted hyacinth bulbs last year, so let’s see if they come up! I always love the way you so beautifully display them! Looking forward to your candle inspiration! Hope you had a lovely Valentine’s Day!